Happy Halloween! In the mood for some Haunted Houses today? 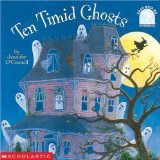 The favorite Halloween book this year at our house is definitely Ten Timid Ghosts by Jennifer O'Connell. Seriously, I've read the book so many times, I can recite it by memory. 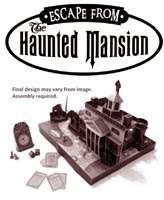 Everything Halloween is included in this read: A haunted house, ghosts, a witch, skeleton, bat, ghoul, cat, owl, vampire, monster, spider, rat, mummy and trick-or-treating. Really, you can't ask for more! But wait, there is more. It's also a countdown so kids learn their numbers from ten to one as well. The book is a great read-aloud, and kids will love counting down and watching the witch try to scare the timid ghosts out of their house. BOO! This looks like it ought to keep the kiddos occupied for quite awhile! Remember, today is the last day you can download this special offer. Happy Haunting! Sorry, I'm going to digress from my normal book/media post, but this is just too funny to exclude from my blog. Cabbage Patch Kids are celebrating their 25th anniversary this year by re-releasing the original dolls. Growing up in the 1980's, I owned two of them myself, so this release has triggered a lot of great childhood memories. If my daughter were at all interested in the dolls, I might just line up to buy her one for Christmas just because. Now here's the hilarious scoop -- There is a strange auction going on at ebay right now involving the Cabbage Patch Kid dolls. You, yes you, can bid on and win your very own one-of-a-kind 2008 Cabbage Patch Kids Candidate doll of your choice: Barack Obama, John McCain, Joe Biden, or Sarah Palin. The auctions are for charity and the proceeds will go to Marine Toys for Tots Foundation. The Sarah Palin doll is currently going for US $1,025.00 with 4d 17h 04m left. Not sure I view any of them as that particularly cute or cuddly! How about you? Pssst....Laurie Berkner Band Fans! Laurie is airing her second webcast tonight (Thursday, October 30th) at 8PM EST. Visit the official Two Tomatoes Website to watch. Just like in her first webcast which occurred about a month ago, she will be reading fan mail and singing one of her songs. Her first webcast has been archived and is available for viewing on her website as well. Haven't heard of Laurie before? Then it is about time you checked her out. My preschooler daughter has loved listening to her cheery, energetic songs since she was one years old. The band's newly released CD is called Rocketship Run . Later in November I'll post a review. In the meantime, Walmart's Soundcheck is airing a SUPERB exclusive video performance of the band singing some of the songs from their new CD. Once I built a tower, now it's done. Brother, can you spare a dime?" - from the song, "Brother Can You Spare A Dime? " Erica S. Perl has posted a really interesting slide show highlighting a few fictional children's books published over a span of many decades that mention difficult economic times. View her post and slide show at Slate.com. Spreading a little Fairy Dust: Tinker Bell DVD Released Today! If you hadn't heard about the new Disney Tinker Bell DVD before this, you must have been visiting Neverland. Hopefully all this press hasn't gone to Tink's head. I'd hate for her to forget her Peter Pan roots. Luckily, Disney draws some of Tinker Bell's life from her character in the book by J.M. Barrie. The movie starts out with the birth of a new fairy, Tinker Bell. After her birth, Tinker Bell must discover her talent. She learns she is a tinker fairy. However, like in Peter Pan, a tinker fairy does not perform very glamorous tasks. They fix and make instruments for the other fairies to use. Tinker Bell is not happy working as common tinker fairy mainly because tinker fairies don't get to visit the mainland. She tries to learn a new talent but fails miserably and ends up making a huge mess of Pixie Hollow, endangering the arrival of spring (the fairies are responsible for changing the seasons.) Fortunately she is able to redeem herself by inventing gadgets to help make the other fairies' work easier and faster. In the end, she is allowed to visit the mainland to take back a music box she repaired to a little girl named Wendy who lost the precious toy. Disney has created a marvelous interpretation of Pixie Hollow for the movie. It sparkles and shimmers like pixie dust. Little girls will love it and will take the message to heart: be true to yourself. Hopefully, some of those same little girls will grow up and pursue mechanical occupations themselves! One happy surprise for me -- Loreena McKennitt is the narrator of the movie and sings the theme song, "To the Fairies They Draw Near ." I'm a long-time fan of hers, and her Celtic, fairy-like music fits Tinker Bell perfectly. Now is as good a time as ever to read the book, Peter Pan by J.M. Barrie. At Project Gutenberg, the free online e-books site, you can read the text and listen to the audio for free! Minute Maid has a good UPC promotion going on involving Disney movies. Get a $5 rebate when you buy Minute Maid juice plus one of the following DVDs: Sleeping Beauty, Tinker Bell, WALL•E or The Chronicles of Narnia:Prince Caspian. A few light snowflakes fell outside our home yesterday afternoon, much to the delight of my daughter. She quickly ran from window to window, announcing, "Snow! It's winter now! The leaves fall off the tree!" To her, snow means that she will get to build snowmen and sled. And, she quickly reminded us that Christmas will soon be on it's way. It doesn't take much to please a preschooler. I myself am not exactly a big fan of winter, but I have to admit that I find the first snowfall of every year quite exciting, too. 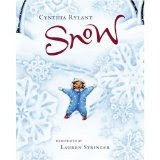 Snow , by Cynthia Rylant, is a new picture book we are looking forward to reading often this fall and winter. The book touches on snow of all types, from big fat flakes to the lightest delicate snow that dances down to the ground. But, most importantly, the lyrical verses celebrate the feelings that a snowfall brings about, especially in children. The blue tinted illustrations of Lauren Stringer help evoke the very best memories of snowfalls in our past and elicits anticipation for those yet to occur. Her paintings magically bring a little girl and her grandmother to life, surrounded by a world brimful of snow. According to Rylant, "The best snow is the snow that comes softly in the night, like a shy friend afraid to knock..." That may be so for her, but in our family we agree, the best snow is the first few flakes of the year! Bookroomreviews.com is hosting a Book Giveaway Carnival, and guess who is posting a giveaway for it? Me! I will be holding my FIRST book giveaway as a participant of the carnival the week of November 3rd - 8th, 2008. Click on the Book Carnival button on my sidebar for more details. If you have a book to giveaway, consider joining the fun. Otherwise, just enter all the contests. Looks like over 70 bloggers have signed up already...that's a lot of books to be won. Watch for my post in a week and while you are at it, view my Full to the Brim blog posts for children's book giveaways that are currently being held in blogosphere! McGraw’s new book describes a normal day in the life of a dad and his daughter and shows that it doesn’t matter what you do, what matters most is just spending time together. Dads, take note of the message and read this book with your daughter! and his Greatest Hits Vol. 3 album. If you love the song "Forever Young," you'll probably love the beautifully illustrated book, too. The orginal song lyrics were apparently written for Dylan's own son way back when. See the video below for a sneak peak! This is our tale of CLR Tackle It Tuesday, presented in conjunction with 5 Minutes for Mom - Tackle It Tuesday #126. The main character appears at left: The bottle of CLR Bath & Kitchen Multi-Surface Cleaner we received directly from the manufacturer, Jelmar, a week ago. The other character would be my husband, also known around here as, "The Best Hubbie in the World." He is the resident tough job tackler with an arsenal of cleaners and chemicals. (I'm a nursing mama, so therefore off the hook when it comes to dealing with chemicals for now.) The tackle takes place in our lovely red kitchen, or to be more precise by the dirty, grimy kitchen sink covered in calcium, lime and hard water deposits. You can see the picture below for documented evidence. Together hubbie and CLR fought an easy battle (due to the power of CLR) and defeated the months old build up. He aimed the CLR about 6-8 inches from the sink directly at the problem areas, let the CLR cleaner sit for a few minutes, and wiped the surface off with a rag. Easy as pie. 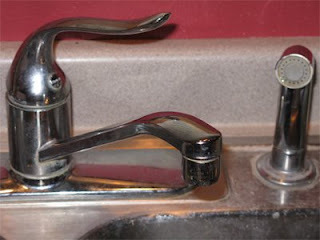 After rinsing with water, result was a nice, shiny, like-new kitchen sink and a very happy wife. What did hubbie have to say about his experience with his new friend, CLR? The Pros: The bottle delivered on its promise. 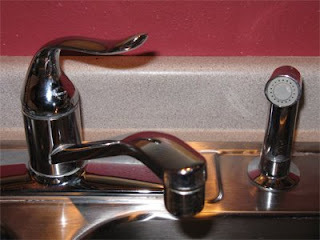 It effectively and easily removed the crud from our kitchen sink without needing much extra elbow grease, as long as you applied the CLR directly to the area that needs cleaning and let it sit a few minutes. The nozzle is easy to aim at difficult to reach areas. CLR also easily removed the soap scum in our shower and bathtub, something that some other cleaners don't easily eliminate. The product has EPA approval and is recognized for safer chemistry. The Cons: Need to use rubber gloves. Definitely follow the warnings about using in a ventilated area. The odor is a little strong and headaches could occur, lungs could get irritated or eyes could sting. Probably not the best choice for pregnant or nursing (that's me) moms. There are safer options out there in that case (like vinegar, water and baking soda). Final say: CLR works great for occasional use when the crud gets out of hand. That's our story. Sink is clean. Tub is clean. The end. Ziggity Zoom Parents - Bunbun Book Giveaway Ends ??? Darn! Yesterday was National Chocolate Cupcake Day and somehow we missed it. Apparently, yesterday was also "Sweetest Day" here in the Midwest. We did not celebrate that, either. So, today we are going to play some catch-up. We are going to make some sweet chocolate cupcakes and frost them with pink icing. Visit http://www.cupcakesforall.com/ for Pinkalicious fun, including printables and more. You still have time to enter the Dunkan Hines “National Bake Sale” Contest. Ends November 1, 2008. As you may already know, I have a pre-school age daughter as well as an infant son. Here in our city, the school system offers 4K for the littlest ones. My daughter will be of age to attend next year, and it looks like all her friends are going. To me, it seems four years old is pretty young to be hopping on the bus and attending school all day. I was five when I started school, and we only attended 1/2 day kindergarten. So you see, I am torn about sending her off. Sometimes I think it would be better to just keep her home with me and work on the early learning lessons together. But then, she may also enjoy the socialization aspect of school and like learning in that environment. What are your thoughts? 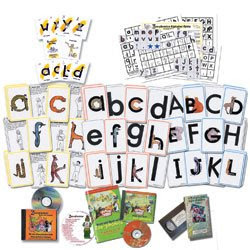 For those leaning toward the homeschooling side or those who wish to supplement their children's education, Heart of the Matter is holding a great giveaway, a Zoo-Phonics Kindergarten Kit (over $299 value). This looks like a super way for your child to learn the alphabet and develop the skills that will someday help him/her become a great reader. Like most kids, my daughter loves animals, so this way of learning the letters would definately be right up her alley. Plus, the kit comes with a parent guide to help you teach your child to learn (a bonus for me because I definately did not get a teaching degree in college!) Check out the Zoo-Phonics site for more information about the kit. Heart of the Matter Zoo-phonics Giveaway ends today, Friday, October 17th at 10pm EST. If you don't win the giveaway, you can always request a Zoo-Phonics Free Sample and Free Report to give you more of an idea what the program is all about. Set of 4 Little Green Books: Little Panda, Little Monkey, I Can Save the Earth! : One Little Monster Learns to Reduce, Reuse, and Recycle and The Polar Bears' Home: A Story About Global Warming. This weekend we are attending a surprise birthday party. My preschooler daughter can hardly contain herself. (She hasn't given it away, though.) She's also wondering why it isn't her birthday more often. But, really, can you blame her? The cake, frosting, balloons and presents really do live up to the hype. Thanks to 5 Minutes for Mom for making us aware of this contest! And if you get a chance, feel free to rate our video while you are at YouTube! Looks as if peak fall color has arrived in our area! Last weekend we enjoyed a morning drive through the country and witnessed the splendor of fall -- the reds, yellows, and oranges of all the trees combined together in a remarkable masterpiece. Pretty soon we'll be working to get all those leaves raked, a seemingly endless job for the adults but, oh, so much fun for the kids. Do you have a favorite fall read? Here are some good ones! Fall Leaves Fall! by Zoe Hall showcases all the fun of falling leaves - stomping, raking and watching them change colors. Great for preschool age kids. Unfortunately, it seems to be out-of-print now so you'll have to search for it at your local library or buy it used! Published last year, Leaves by David Ezra Keats is a delightfully simple book about falling leaves, a bear, the change of the seasons from fall to spring and hibernation. The book is a winner of the 2008 Ezra Jack Keats New Writer Award. A couple of other books of the leaf variety: In The Leaf Man by Lois Ehlert, the leaf man gently flutters and flies over multiple locations; various tree species are featured. Another great Ehlert book is Red Leaf, Yellow Leaf. 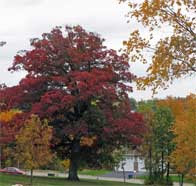 It is about the life of a sugar maple tree and the illustrations are full of autumn colors. Today is Blog Action Day and the focus is poverty. Poverty is a harsh reality for many millions of people today. Many steps need to be taken to reduce this pressing need, but the first thing that must be done is that we as individuals must stop turning a blind eye towards those that need help the most. Use this as an opportunity to talk to your kids about those less fortunate than themselves. And, remember to support literacy causes such as First Book and RIF. Literacy can go a long way!! One book you may want to discuss this holiday season is A Christmas Carol by Charles Dickens. The major theme of this book is poverty; Dickens was especially concerned about the welfare of poor children. Happy 50th Birthday, Paddington Bear! What kid doesn't love the little duffle coat, floppy hat wearing bear? We are going to celebrate his special day today by visiting the library, checking out A Bear Called Paddington by Michael Bond, and enjoying some marmalade. Did you know he is named after the train station in London where the Brown's first found him or that he was orginally from Peru? Make sure to visit his very own website today to learn about his journey and all his favorite things! Given the state of the economy, right now seems like a good time to talk with your children about money. No matter their age, they can benefit from a little finacial literacy. There are so many great children's books that can help you discuss money, finance and savings. Kidsreads - MONEY: It's All About the Benjamins! Jump$tart Coalition for Personal Financial Literacy - this is a massive website. Each state has its own coalition. Meant for educators, parents will also find alot of useful information. Itty Bitty Bookworms Fall Book Giveaway Ends 10/12/08?? Having Fun at Home Construction Zone Giveaway Ends 10/13/08? We already own her 2007 "Fascinating Creatures" release, an excellent, excellent folksy children's CD with a light, breezy-dreamy feel to it. Can't wait to hear her newest album, Family Tree, in its entirety. Seems Putumayo can't do wrong. They continue to produce great compilations of world music for both kids and adults. Artists on this album include Ladysmith Black Mambazo, Toumani Diabaté and Samite. Putumayo Kids newly released Sesame Street Playground also earned a Fall 2008 special mention. Zany Zanes worked together with Latino friends and compiled some great songs for his ¡Nueva York! album. A great bilingual choice for your collection. A follow-up to Here Come the ABCs, the album is a 2-disc, CD/DVD combo. Great fun, musical way to celebrate and learn your numbers. And this is only the beginning...don't stop with just these! Make sure to check out all 41 albums on the Fall 2008 winners on the Parents' Choice Website along with their picks for best Audiobooks and Storytelling winners. Better yet, win a copy of one of the picks!! Enter Muse Reviews contest to win Sesame Street Playground. You have one day! Ends 10/9/08. Mem Fox is an awesome children's book author who happens to live in Australia. Her well written books often feature Australian wild life -- the cute, cuddly variety. If you haven't read any of her books to your children, you must do so immediately! Some of her animal picture book titles include Koala Lou, Possum Magic and Hunwick's Egg. Mem Fox's latest book released 10/1/08 is sure to become a classic as well. In Ten Little Fingers and Ten Little Toes, Fox teamed up with beloved illustrator Helen Oxenbury to create a wonderful book celebrating babies of the world. Just now I stopped by Seven Dogs and A Baby blog and read her latest entry, "I want to go to the zoo!" We visited our local zoo last week as we do every year in October. The air felt crisp and you could tell fall is here to stay, with highs only in the 50's. But we still had a good time and my daughter was able to see one of her favorite animals, the kangaroo. They weren't feeling particularly energetic at the time and looked as though they were napping (no hopping), but who could blame them given the chill in the air. Maybe some day we'll get to visit Australia and see the kangaroos in their actual habitat? If we can't have the real thing, a stuffed one might do. Seven Dogs and A Baby is giving away a National Geographic Kid kangaroo. Contest ends 10/30/08. DK Made with Care Series features DK's eco-friendly books. See the DK site for all that they are doing to become environmentally friendly as a company. Little Green Books by Little Simon are the newest rage on the S&S (Simon & Schuster) site. The books focus on eco-friendly living. Each title is made out of recycled materials. Eco Childs Play blog reviews green children's books. Great for learning what literature options are available for kids. For Kids: “I Can Save the Earth!” Sweepstakes. Kids (over 5 years of age and under 10) can download the entry form and write a 300 word or less essay on what they are doing to help save the environment. Entries must be postmarked by December 1, 2008. Did you read a great children's book published between Jan. 1 - Oct. 15 2008? Nominate it for a Cybils Award in one of the nine categories listed on the site. Nominations close on October 15th, 2008 and everyone can participate. The goal of the Cybils team (some 100 bloggers) is to highlight books that are high in both literary quality and kid appeal. The Cybils were founded by Anne Boles Levy and Kelly Herold. This is the third year for the awards. One last quick fact - Cybils is an acronym for Children's and YA Bloggers' Literary Awards. Thanks to Jen Robinson's Book Page for a head's up about the Cybils. Twenty-five (25) winners will each receive a hardcover copy of The Lump of Coal by Lemony Snicket, illustrated by Brett Helquist. Ten (10) winners will each receive the entire Madagascar: Escape 2 Africa book publishing program. One winner each month, will each receive an iPod Shuffle. Twenty (20) winners will receive a copy of The Greatest Story Never Told by Ray Negron, illustrated by Laura Seeley, Baseball Treasures by Stephen Wong, illustrated by Susan Einstein, and Jim & Me by Dan Gutman. Twenty-five (25) grand prize winners will each receive a copy of the new The Chronicles of Narnia: Prince Caspian DVD. Estimated prize value: $39.99. Five(5) first prize winners will each receive a paperback edition of all seven books in The Chronicles of Narnia, featuring spectacular jacket art by three-time Caldecott Medal winner David Wiesner and the classic interior black-and-white artwork by Pauline Baynes. Fifteen (15) winners will receive the following books: The Last Apprentice: Wrath of the Bloodeye, Warriors: Power of Three #4: Eclipse, RuneWarriors, Geek Chic: The Zoey Zone, Nightmare Academy #2: Monster Madness, Araminta Spookie 5: Ghostsitters, The Porcupine Year, Hate That Cat, The Floods #3: Witch Friend, The Leanin' Dog, Forbidden Tales: Sword, Warriors: Tigerstar and Sasha #1: Into the Woods, The Hunt for the Seventh, Mascot to the Rescue!, and Mo's Mischief: Best Friends. Twenty-five (25) winners will each receive The Graveyard Book by Neil Gaiman. Ten (10) winners will each receive the entire Warriors (author Erin Hunter) book publishing program. Three (3) winners will receive a signed set of The Last Apprentice books. Kids haven't decided yet on a halloween costume? You are in luck... 5 Minutes For Mom is hosting a costume giveaway. All the costumes they are giving away are real-life "hero" designs from the Pedal Cars and Retro Collectables store. It wasn't hard to pick my favorite! Grandpa is an Air Force Vet so he'd love to see his grandchild in the Jr Air Force Pilot Suit & Helmet Costume (Size 12-14). If your kid is plane-crazy, this book is a must have. DK Big Book of Airplanes by Anne Millard. Part of the DK (Dorling Kindersley) series, this is a giant book filled to the brim with airplanes of all types. Younger kids will enjoy the great pictures and the older ones can spend loads of time learning all about aviation. Zonderkidz, a division of Zondervan Publishing has just released a new series of Berenstain Bears books by Michael Berenstain focused on faith. The first four titles in the 12-book series are The Berenstain Bears and the Golden Rule, The Berenstain Bears Go to Sunday School, The Berenstain Bears Say Their Prayers, and The Berenstain Bears - God Loves You!. The Zondervan website describes the new series saying, "The Berenstain Bear series helps children learn how God wants them to live every day. When the Bear family practices going to church, praying, and being kind, plus remembering how much God loves them, their lives are much more joyful." I plan on giving a set of these books to my Godchild for his baptism birthday. The books are available for $3.99 each from most booksellers and Christianbook.com is selling the 4-Book Set for $10.99. Visit the Berenstain Bears website for more detailed information about the Bears and their creators.